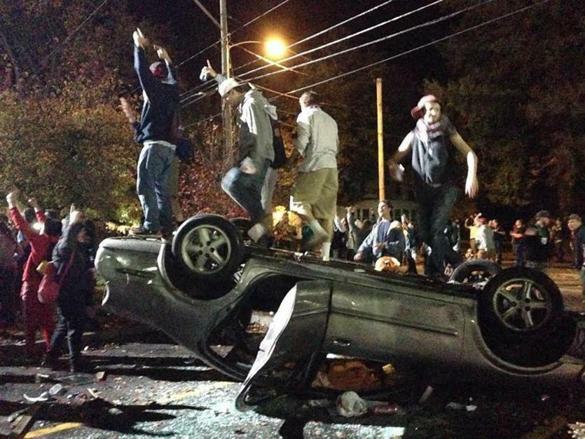 This past weekend in New Hampshire, white college students got drunk, flipped over cars, set bonfires, slid dumpsters down roadways, and demolished areas of Keene – the city where the annual Pumpkin Festival took place. Why? I just told you. They were drunk. What? Not buying it? Not convinced that drunk white people are entitled to random spasms of unhinged, chaotic rage? Well, look in the mirror. See that un-American person there? That’s you. However, this isn’t just about Ferguson. Ferguson isn’t the first time black people protested just like Keene isn’t the first time (or last time) white people will act a public fool. Minimizing this conversation into a flat comparison of Ferguson versus Keene is ignorant talk. This conversation is much larger than that. It touches on the nuanced ways we (mis)behave in civil society and the foundational inequalities therein. To this point, it seems white people are so saturated in their own privilege, they can’t even see how the narratives of Ferguson and Keene collide. The former happened because of a grave injustice. The latter happened because white people feel entitled to demolishing anything whenever they deem it necessary or fun. In describing the “mayhem” to the Sentinel Source, one student said the following of the Pumpkin Fest Riot. “It’s (expletive) wicked,” said Steven French, an 18-year-old who was said he was visiting from Haverhill, Mass. Another anonymous student said, “Let’s (expletive) riot.” So, it seems that – not only were the riots attributable to inebriated white college kids’ lack of home training – they were also a conscious decision on the part of this cohort to do the wrong thing…on purpose. Looking for something “fun” to do, these college students thought fire and brimstone were the best options. Let’s make this crystal clear: these white college students were bored and drunk and all they could think to do was set fire to things and demolish private property. Doesn’t that sound like “thuggish” behavior? Let’s compare these actions to those in the black community which have been answered with murderous violence. This is the tale of two Americas. In one, black and brown bodies are criminalized at birth. Black women are shunned for bearing them then once they are here in the flesh, white America does its level best to beat them to a bloody pulp. In the other America, white college students (the leaders of tomorrow I guess) frequently practice racism, misogyny, deviant behavior, and other non-savory attributes but they get a perpetual pass because of their whiteness. Whiteness is literally a “Get Out of Jail Free” card in this country. Yeah. Okay. Except no. They weren’t treated “just like everyone else.” And them surviving the evening isn’t a measure of that fact. Simply, those college students managed to lay waste to a city without a change in the public narrative about the sad state of the white community. Many white folks didn’t even bat an eye at the actions of this wayward few because they, themselves, were completely comfortable in knowing this had absolutely no reflection on their own moralistic character. They were secure, unphased, complacent even. Therein lies the difference. Every single time a black or brown person is victimized in the US, whites characterize the lot of us as deviant, tinged, violent, and dangerous. Mainstream media plays along. And, in the end, we have an endless loop of anti-black rhetoric both fueling and sustaining the very unfounded notions they began with. This is the epitome of privilege. This is the definition of inequality. The 2014 Pumpkin Fest Riots can only be framed as such. And, no matter how much we like white people, we can’t deny how symbiotic these instances are with their very existence.